How do members of dominant groups, like US Whites, react when their privileged social status is threatened, for example, by the prospect of numeric decline? Prior studies identify two sets of reactions: (1) Whites identify more strongly with ingroup members, and (2) they withhold material and symbolic resources from outgroup members. Boundary-making scholars raise another possibility: Whites may alter the boundary around Whiteness by redefining the criteria for membership. 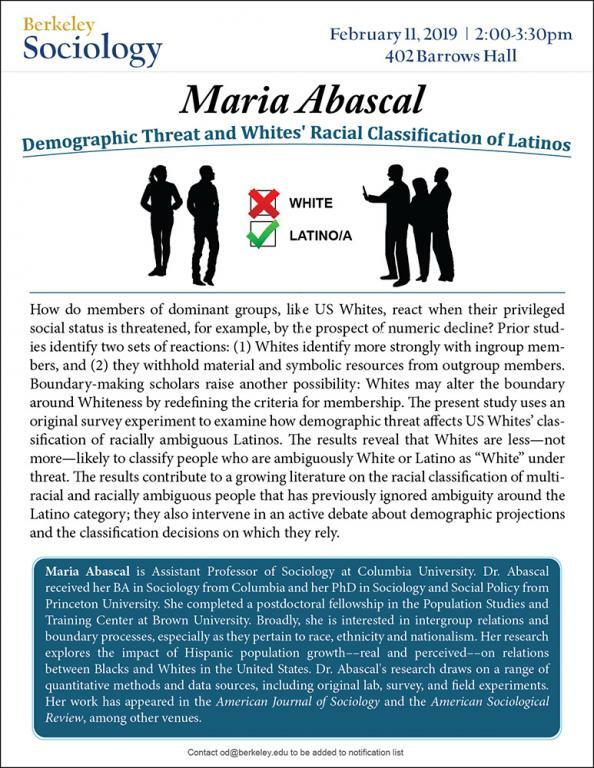 The present study uses an original survey experiment to examine how demographic threat affects US Whites’ classification of racially ambiguous Latinos. The results reveal that Whites are less—not more—likely to classify people who are ambiguously White or Latino as “White” under threat. The results contribute to a growing literature on the racial classification of multiracial and racially ambiguous people that has previously ignored ambiguity around the Latino category; they also intervene in an active debate about demographic projections and the classification decisions on which they rely. Maria Abascal is Assistant Professor of Sociology at Columbia University. Dr. Abascal received her BA in Sociology from Columbia and her PhD in Sociology and Social Policy from Princeton University. She completed a postdoctoral fellowship in the Population Studies and Training Center at Brown University. Broadly, she is interested in intergroup relations and boundary processes, especially as they pertain to race, ethnicity and nationalism. Her research explores the impact of Hispanic population growth––real and perceived––on relations between Blacks and Whites in the United States. Dr. Abascal's research draws on a range of quantitative methods and data sources, including original lab, survey, and field experiments. Her work has appeared in the American Journal of Sociology and the American Sociological Review, among other venues.